To have a cage in the right size and of the right type, is an important part of keeping your hamster healthy and comfortable. To help you find the best Syrian hamster cage for your furry little friend, we decided to compare and review the four best choices. 4 Which is the Best Hamster Cage? Before reviewing them, let’s talk about what the optimal cage would be like. And remember, Syrian hamsters should live in solitude. If you try to pair them up with another one, it will not go well. There are several things you need to consider before buying a cage for your Syrian hamster. Wire cage. The walls and roof are made from metal wire, and it has a plastic bottom. Aquarium. Made from plastic or glass. Often has a wire mesh top. Plastic modular cage. Can be connected to additional units to create larger habitats. Usually has tubes and multiple compartments, which could be fun for smaller hamsters. Be aware, the relatively large Syrian hamster could get stuck in the tubes. For Syrian hamsters, our opinion is that you should go with a wire cage with a solid plastic bottom (and that’s why we only have reviewed cages of this type). Why is that? The biggest reason is because wire cages have much better ventilation than the two other types. Aquariums and plastic cages have solid walls that limits air circulation, which could lead to poor air quality and condensation. Wire cages are also easier to clean. If you need a third reason; climbing on the wire can be fun and provide exercise for the hamster. Wire cages do come with a disadvantage though. Because the walls aren’t solid, your hamster will be exposed to wind and draft. Make sure to place the cage in a warm and protected spot in your home. Otherwise you could end up with a sick pet. Many new owners buy too small cages, probably to save money or simply because they don’t know any better. Don’t make that mistake! The Syrian hamster is the largest species of the five that are kept as pets, and it grows rapidly the first couple of months. So, make sure to get a properly sized cage. You really can’t go too large, so don’t hold back. Buy the largest one you can afford (the same goes for the size of the exercise wheel). To stay healthy, Syrian hamsters need a lot of exercise. A large floor allows them to freely run around as much as they want to. Syrian hamsters are good at climbing up, but terrible at climbing down. In fact, they are so bad at climbing down that they frequently fall. A cage with great height thus increases the risk for serious injuries. A lower type of cage reduces that risk. When it comes to minimum dimensions, there are a lot of different opinions floating around. As I mentioned earlier, bigger is better. But, according to the National Hamster Council, the absolute bare minimum floor space should be 1000 cm² (155 in²), while the height should be at least 19 cm (7.5 in). I personally think that is too small, and instead support the 10 gallon (1.34 ft³) minimum recommendation given by the ASPCA. All the five reviewed cages are way larger though. Smallest one if 2.3 ft³. Why is it important to have a large cage? Hamsters that live in smaller type cages have a higher risk of becoming aggressive. They try to defend their territory, or defend themselves against a perceived enemy. Living in a small cage also increases the risk for developing compulsive behavior, like chewing on the bars or constantly pacing in circles. This type of behavior is unhealthy, and must be addressed immediately (try larger cage, exercise wheel, chew toys, and more bedding). Taking good care of your hamster means that it will live longer! When getting a baby hamster, should you start off with a smaller cage? No. Syrian hamsters double in size in just a few weeks, so you would have to change to a larger cage almost immediately. Don’t waste your money and time by doing this! Make sure that the cage you buy is both safe and secure. Safe. Especially for vertically shaped cages, there shouldn’t be any spots where the hamster could fall down all the way to the bottom. The space between the bars. It shouldn’t be more than ½ inch. The door. Check that the locking mechanism is secure. For an extra level of security, use a metal clip to lock the door. Keeping the cage clean is an important part in taking good care of your pet. Unfortunately, it’s not the most fun activity I can think of. So, be smart and buy a cage that is easy to clean. I’m sure you would have more fun if you spent the saved time together with your hamster. Wire cages with plastic bottoms are the easiest to clean. Just lift the wire off the plastic bottom and remove the soiled bedding along with any hidden food. Quick and easy! To be more thorough, you could wipe off the wire as well. Aquariums are heavier and a bit more difficult to clean, and plastic cages with several compartments and tubes are even worse. Create a deep comfortable bedding. Make sure to use the best bedding for your Syrian hamster. Provide an exercise wheel and some toys. This will ensure that your hamster is properly stimulated and exercised. Don’t place the wire cage near windows, doors, or in any other drafty spots. Your hamster could get ill from living in cold and drafty environments. Change water daily. Access to fresh water is very important. Provide a hideout where it can sleep and get more privacy. After your hamster has settled in its new cage, pay attention to its behavior. Is it gnawing on any weak spots trying to escape? Try to fix those spots before your little friend runs away. Then give it something to gnaw on as a substitute, like a piece of wood or a chew toy. Does it have a circling behavior, or is it chewing on the bars? That could indicate that it’s bored and not stimulated enough. Take action before it becomes a compulsive behavior! Getting a larger cage, and providing something to chew on (chew toys or piece of wood) will normally fix this issue. If the problem remains, contact a veterinarian! Because we strongly believe that wire cages are the most suitable type of cage for Syrian hamsters, we decided to focus entirely on them. Here are reviews for the 4 best wire cages for Syrian hamsters. Living World Deluxe Habitat is selling like hot cakes. Many hamster owners now use this spacious and practical wire cage. It’s available in three different sizes – Standard, Large, and X-Large. The extra large version is gigantic (47 x 22.8 x 24 in), and so we decided to review the standard version (30.7 x 18.9 x 19.7 in). But you could opt for a Large, which currently is selling for roughly the same price as a Standard cage. At 580 in², the Living World Deluxe Habitat (standard size) is a very roomy cage, well over any minimum size requirements. It comes equipped with almost everything your pet hamster needs. Water bottle, hay guard, a hidden space under the balcony where it can sleep, and a food bowl that doesn’t tip. The only thing missing, is an exercise wheel. You can easily access all areas of the cage either by opening the wire top, or through the door at the front. This makes it easy to reach in for your pet, and it also makes cleaning a breeze. When you order the Deluxe Habitat, it’s shipped in a compressed format. The package looks like this: This means that you will have to assemble it yourself. But don’t worry, you don’t need any tools, and it only takes a few minutes. If you have room for this fairly large cage, we think it’s a great buy. 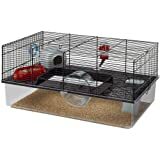 Lixit Animal Care Savic Hamster Heaven Metro Cage is large and well ventilated (just like all wire cages). It’s packed with fun things for your Syrian hamster – tunnels, exercise wheel, and slides. It also has necessities like a water bottle, a food bowl, a hideout, and a litter box. Just like with the Living World Deluxe Habitat, you need to assemble it yourself. But it’s easy and only takes a couple of minutes, so don’t sweat it! This cage from Lixit is truly great. You don’t have to do or buy anything else, just assemble it, and you (and your hamster) are ready to go. It comes at a premium, but as long as you can afford it, it’s definitely worth the money. Ferret Kit Cage is available in two different sizes; medium and large. Large is enormous (>800 in²), while Medium has a 527 in² floor space. Plenty for a Syrian hamster. It has all the basic features a good cage should have. Feeder bowl, water bottle, litter box, and a hiding place. It also has two fun tubes to play with. The solid plastic bottom and the easily removable wire makes it easy to clean. This cage comes at a cheap price. Just add an exercise wheel, and you will have a nice and practical cage. Good choice if you’re on a budget! 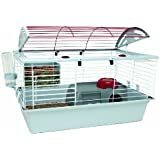 Ferplast Favola Hamster Cage is a great choice if you don’t have a lot of money to spend. It has all the basic things that every hamster cage must have – like water bottle, food bowl, and a protected space where it can sleep. But it’s also equipped with an exercise wheel, which is an essential part of a proper cage. I really like the transparent plastic base, which helps you to keep an eye on your beloved pet at all times. The Ferplast Favola is the only reviewed cage that has this handy feature. A nice bonus feature is the special cap that can be connected to other units and cages if you want to expand the habitat. Now, let’s talk about what is not so good about this cage. The size. Although it is certainly large enough to accommodate a Syrian hamster without any problems, it’s a lot smaller than the other four alternatives. If you have a large Syrian hamster, you might want to choose another cage. All in all, I think you get a lot for the money. Choose the Favola, and you’re set. You don’t have to buy any additional accessories. Which is the Best Hamster Cage? Ok, time for the million dollar question. 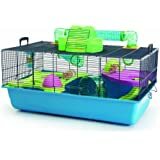 Which is the best cage for your Syrian hamster? If you are cash rich and ready to spend, go with the Lixit Hamster Heaven Metro Cage! It’s got plenty of room, and all the accessories you may need (and then some). It’s well ventilated and easy to clean. Simply speaking, it has everything you and your hamster will need! If you’re on a budget, my advice would be to buy the Living World Deluxe Habitat. It’s spacious, affordable, and super easy to clean. The only thing missing is an exercise wheel. Could you add a search engine and more cage type because I was looking for tank cages I was disappointed when i couldn’t find it. Tanks have poorer ventilation than wire cages, and that’s the main reason why I didn’t include any tanks in my top 4 list. 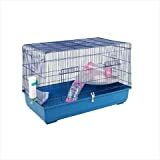 I want to help readers find the best cage for their hamsters! What exactly do you mean by adding a search engine? Hmm. This seems dodgy. Only two of these cages would pass as suitable in Europe- the hamster heaven and the larger sized living world one. Even then the hamster heaven is the bare minimum- 80*50cm. You can get larger cages at more affordable prices. None of the wheels that come with these cages are safe. It’s not a pro for cage to come with a wheel, as they’re not going to be large enough and needs to be thrown away. Syrian hamsters need wheels 28cm+ in diameter, as they are susceptible to spine damage in smaller wheels. I’d also like to point out that there are aquarium style enclosures which are perfectly well ventilated. The Marrakesh, or the living world eco habitat are both designed with small animals in mind. This style of tank also avoid the habit of bar biting, which can break their teeth and scratch their face.